This stylish set comprises a hand shower from the GROHE New Tempesta range, a shower rail and a shower hose, and is the perfect upgrade for your bathroom. Providing an excellent combination of design and functionality, it comes with the lustrous GROHE StarLight chrome finish and features like the ShockProof silicone ring to protect the hand shower from damage when dropped. The SpeedClean anti-lime system means that any limescale collecting on the silicone nozzles on the shower head can be easily removed with just a wipe. Your cleaning routine will be much speedier, so you'll have more time to indulge in a relaxing spa-type shower with a choice of the sensation of a warm summer rain (the Rain spray pattern) or the powerful Jet spray for a more invigorating shower. 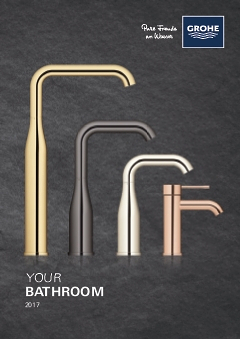 The GROHE DreamSpray technology ensures an even flow whichever pattern you choose.